Steam room and sauna two most popular sweat-based treatments with some common therapeutic benefits and some significant differences. They both produce heat but in different proportion tailored to different outcomes. This article explores the difference between sauna and steam room. The steam room is characterized by 100% humidity with temperatures ranging from 40 to 70 degrees Celsius. As reflected in the name, steam room uses steam (wet heat, moist heat) propelled by the steam generator to heat up the room and provide health benefits: relaxes muscles, releases muscle tension, rejuvenates the skin, enhance cardiovascular health, increase heart rate, boost respiratory functions, reduce stress, and many more. Steam traps 100% of humidity by insulating the entire room with non-porous materials such as tiles, plastics or glass. Upon entrance, the room feels moist and the body starts feeling hot. The moist heat prevents sweat from evaporating; as thus, the steam room feels hotter than the sauna. But, in practical, sauna is hotter than steam room with it temperatures ranging from 80 to 100 degrees Celsius. Moreover, a human body sweats more under sauna than in the steam room despite the high moisture content on the body in the steam room. There could a particular scent or the eucalyptus oil in the steam room to enhance the experience. The steam rises in the steam room. That being said, sitting higher in the room exposes the body to more heat while sitting lower deprives of the body more steam. Steam room has the downsides, which can be potentially risky. Because the steam prevents sweat from evaporating which then increases the body temperature, those allergic to high heat may faint or feel dizzy while in the room. This could be exacerbated by pre-existing condition, prolonged stay in the steam room, and failure to hydrate the body before getting in the room. To alleviate these, people are urged to seek medical attention for the diagnosis of heat-sensitive conditions; drink more fluids and stay less than 20 minutes in the room. If it is the first time using steam room, smaller intervals of time could be helpful in avoiding potential health risks related to heat. Sauna is a spa treatment that uses dry heat heated from 80 to 100 degrees Celsius to provide therapeutic benefits to humans. A heat source is used to heat a stalk of rocks that radiates heat. There could be an infrared light-based sauna that uses relatively low temperature. This option could be useful to those allergic to dry hot hair: people with rheumatoid arthritis. Sauna has the lowest moisture content, which is roughly 5 to 30%. The moisture can be increased by sprinkling water to the rocks, but it is never equated to the steam room. Sauna often has a vent at the floor next to heat source to capture air in. This vent also prevents the build-up of air as the purpose of sauna is dry hot air not wet heat. Besides, more moisture is absorbed by the wood structure used in building sauna. Had sauna been built with non-porous materials such as tiles, metals or plastics, it would burn the body on contact hence only wood is predominantly used: cider, aspen, pine wood, and others. There are different types of saunas, viz. electric sauna (using electric heater), smoke sauna (using wood burning stove to heat rocks without chimney), infrared saunas (heat reflected as light by the heating element), and wood-burning sauna (produces heat by burning rocks or wood. Sauna is renowned for its benefits on cardiovascular health. It shares some benefits with steam room. In some studies, it has been proven that sauna eases some chronic health conditions such as diabetes, high blood pressure, Alzheimer’s disease, and heart failure. On the downside, sauna can also have the same risks as the steam room: dizziness and faintness. Pregnant women in their early stage of pregnancy are discouraged from using sauna. Other medical conditions such as lung failure, heart failure, and kidney failure require a green light from the physician to check if they can withstand the higher temperatures in sauna. Steam room is a steam-based body treatment that releases stress, soothes respiratory muscles, reduces muscle tension, and provides more benefits. Sauna is a dry heat-based body treatment that also provides many therapeutic benefits such as stress reduction, opening of skin pores, and many more. The popular statement that sauna and steam detoxify the body is not backed by any scientific findings. Again, the claim that the treatments reduce body weight has been overstated. During the treatments, the body loses too much water not fat. Once it gets rehydrated, the body weight stands. That shows the inefficiency of sauna and steam room in reducing body weight permanently. Sauna is done at temperatures ranging from 80 to 100 degrees Celsius. It contains less humidity level ranging from 5 to 30%. Steam room has temperatures ranging from 40 to 70 degrees Celsius, and has humidity of 100%. Because the aim is to capture 100% humidity, the steam room is made of non-porous materials such as plastic, glass or tile. Steam generator is then heated to discharge steam in the room without being absorbed by any building material. Sauna, on the other hand, is made of wood to absorb the moisture and to lessen the risk of being burned by non-porous materials since sauna commands very high temperatures. Wood would degrade faster due to the high moisture content if it had been used in the steam room. Anyone with respiratory conditions could struggle to tolerate the dry air in sauna whereas in the steam room it can be beneficiary. Heart failure, kidney failure, sugar diabetes, high blood pressure are some of the conditions that need to be checked before subscribing to any of these body treatments. Both treatments are high-heat-based. As thus, caution should be exercised to avoid feeling dizzy or fainting. Lusi Madisha. 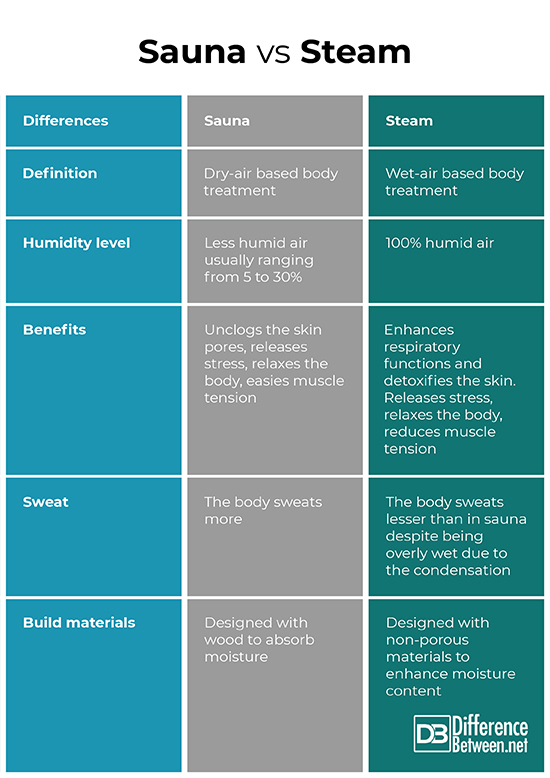 "Difference Between Sauna and Steam." DifferenceBetween.net. January 9, 2019 < http://www.differencebetween.net/miscellaneous/difference-between-sauna-and-steam/ >. Alan E. Sanderfoot (2005). Hot Tubs, Saunas and Steam Baths: A Guide to Planning and Designing Your Home Health Spa. Storey Pub. Malia Frey (23 May 2018). Sauna vs. Steam Room: Which Is Better? 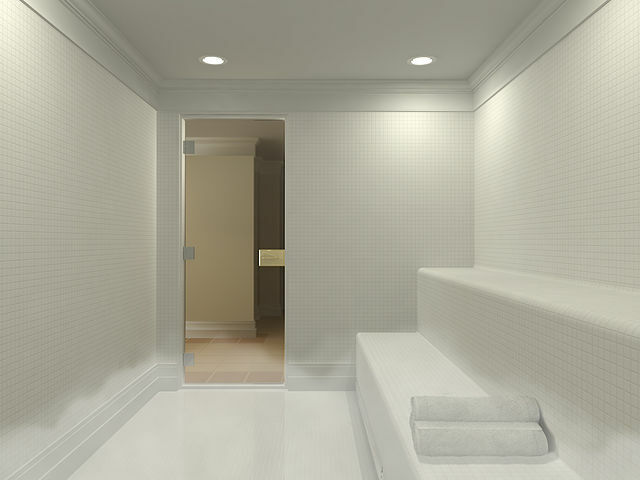 Accessed at: https://www.verywellfit.com/sauna-vs-steam-room-which-is-better-4163009. Accessed on: 23 September 2018.